"... Even that we found ourselves together here at this moment, found ourselves together with this degree of national culture, with this language, these manners, these civil benefits, this degree of freedom of conscience, is the result perhaps of all previous events in the world: The entirety of world history, at least, were necessary to explain this single moment. "Out of the entire sum of these events, the universal historian selects those which have had an essential, irrefutable, and easily ascertainable influence upon the contemporary form of the world, therefore, which must be seen in order to assemble material for world history. World history thus proceeds from a principle, which is exactly contrary to the beginning of the world. The real succession of events descends from the origin of objects down to their most recent ordering; the universal historian ascends from the most recent world situation, upwards toward the origin of things." -- Friedrich Schiller, What Is, and to What End Do We Study, Universal History? , address delivered May 26-27, 1789, Jena University, published in Friedrich Schiller: Poet of Freedom, Volume II , August, 1988. "Schiller, in his historical writings, particularly his lecture entitled 'The Legislation of Lycurgus and Solon', correctly saw history as a conflict between two opposing philosophies of law, the one exemplified by the republican reforms of Solon of Athens and the other the oligarchical system of Lycurgus, the mythical founder of Sparta. "In contrast, as Schiller writes, Lycurgus 'worked against the highest purpose of humanity, in that through his well thought out system of state, he held the minds of the Spartans fast at the level where he had found them and hemmed in all progress for eternity. ... All industry was banned ... all science neglected. ... '" -- William F. Wertz, Jr., "Foreword" from Friedrich Schiller: Poet of Freedom, Volume II , August, 1988. "... Great Creator of the World! I look with adoration on the work of your hands, shaped in accordance with five artistic forms, and in the middle the Sun! -- Spreader of light and life, who constrains the planets according to holy laws and guides them in different orbits. I see the labors of the moon, and there, above, the stars spread out over an immeasurable field -- father of the World, what moved you to lift up a poor, small, weak creature of the earth so high? So high that he stands in the radiance of a wide-ruling King, almost a God: for he is able, following you, to rethink your thoughts. Ruler of the world! Eternal power! Your infinite radiance spreads through the universe on bright wings of light!" -- Johannes Kepler, 1571-1612, quoted in "The Astronomer Johannes Kepler", Rosemarie and Rolf Schauerhammer, published in New Solidarity Newspaper [precursor to New Federalist], March 23, 1984. "[At] the mid-fifteenth century church Council of Florence, ... Nicolaus of Cusa and his allies succeeded in uniting the western and eastern churches around the principle of the Filioque. "The Filioque, reflected down to modern times in the Nicene Creed adopted at Florence, asserts that the Holy Spirit proceeds from both God the Father and from God the Son; therefore, as each individual human being participates in Christ, each individual has the potential for creative participation in the development of the universe -- the essence of Christian natural law. 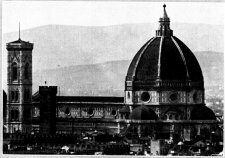 "The cultural program of the Council of Florence spurred Western Europe's Golden Renaissance to advances in painting, sculpture, geometry and science. The political program of the Council sought to capture these great advances in culture in the establishment of a revolutionary ordering of human affairs in both East and West: the creation and strengthening of sovereign nation-states committed to economic growth, and the development of populations which could eventually function as educated, self-governing citizenries. This was Nicolaus of Cusa's ideal of the Catholic Concordance." -- Donald Phau, "Venice: The Methodology of Evil, Part I," The American Almanac, May 16, 1994. "Geometry is one and eternal, a reflection out of the mind of God. That mankind shares in it is one reason to call man an image of God." -- Johannes Kepler. "The outcome of that Fifteenth-Century change, wrought as the fruit of long, preceding struggles by Christianity, was the establishment of the principle, that the purpose for replacing the previously established feudal and other oligarchical forms, by a republican form of perfectly sovereign nation-state, was to shift the function of government from service to the ruling oligarchy, to providing each and all individual persons of the nation, the access to that opportunity for personal development, and for the useful expression of that development, by means of which the individual might have the opportunity to realize a permanent meaning for his, or her passage through mortal life, might realize a meaning for personal identity efficiently located within the more durable reality of the Creator's simultaneity of eternity." -- Lyndon LaRouche, "The Case of the Inedible Professor", The Executive Intelligence Review, July, 1997. "[A]ll legitimate authority arises from elective concordance and free submission. There is in the people a divine seed by virtue of their common equal birth and the equal natural rights of all men so that all authority--which comes from God as does man himself--is recognized as divine when it arises from the common consent of the subjects. One who is established in authority as representative of the will of all may be called a public or common person, the father of all, ruling without haughtiness or pride, in a lawful and legitimately established government. While recognizing himself as the creature, as it were, of all his subjects as a collectivity, let him act as their father as individuals. This is that divinely ordained marital state of spiritual union based on a lasting harmony by which a commonwealth is best guided in the fullness of peace toward the goal of eternal bliss." -- Cardinal Nicolaus of Cusa [1401-1464], from The Catholic Concordance, 1434. "I have seen nothing which has more destroyed and annihilated the power of the Romans than the fact that they listen more to their individual interest than to the common good.... When Justice reigns in a kingdom, the common good is well guarded, and so is the particular: Because Justice is such a virtue that maintains human company and common life, providing that everyone makes a wise use of common things as common; and of particular things as particular." -- King Louis XI of France [reigned 1461-1483], from Le Rosier des Guerres. "The Brotherhood of the Common Life was a teaching order, started in the 1390s and early 1400s in The Netherlands and in Germany. The importance of the Brotherhood's work was that, in focussing on the education of poor children, it began a process that led to a Renaissance throughout Europe in the fifteenth century, through the creation of a national intelligentsia derived from the poor and oppressed, not merely from the ruling elite. In doing so, they laid the basis for the development of the modern nation-state in France, between the years 1461-1483, under Louis XI. "There are two interrelated features to their contribution: First, it was only through mass or relatively universal education that a population could ever be educated sufficiently to practice self- government. Second, it was only this way that modern economy, based upon advances in science and technology, could be fostered, since such an economy requires an educated labor force." -- Will Wertz, "How the Brotherhood of the Common Life Educated Orphans", The American Almanac , April 1, 1996. "In Mediterranean history, since the time of Plato, Plato's deadly adversary Aristotle has been used as the leading apologist for slavery and usury, and as the official philosopher of those who denied the existence and free choice of the individual human soul. 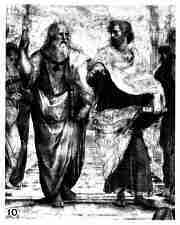 The importance of Aristotle in service to the enemies of Mosaic Judaism and Christianity is located in Aristotle's deductive system of formal argument. In Aristotle's essentially nominalist system of deductive sophistries, the individual soul cannot exist except as something arbitrary deus ex machina. Aristotle's formalist method stultifies science, and eliminates the notion of imago Dei. For such and related reasons, the usurious oligarchy has adopted Aristotle as its official court philosopher." -- Webster Tarpley, "The Role of The Venetian Oligarchy in the Reformation, Counter-Reformation, Enlightenment, and Thirty Years' War - Part I", The American Almanac , March 22, 1993. "But what do fish care about law? As among brute beasts aquatic creatures have the least intelligence, so among human beings the Venetians are the least just and the least capable of humanity, and, naturally, for they live on the sea and pass their lives in the water; they use ships instead of horses; they are not so much companions of men as of fish and comrades of marine monsters ... they wish to appear Christians before the world, but in reality they never think of God and, except for the state, which they do regard as a deity, they hold nothing sacred." -- Pope Pius VI (Piccolomini), Memoirs of a Renaissance Pope, December, 1462. "... many of the disasters of modern history have been rooted in the heritage of the former Venetian Republic. This includes the central role of the Venetians in cutting short the Golden Renaissance of Italy, in precipitating the Protestant reformation and the wars of religion, and in creating the pseudo-scientific, irrationalist currents of thought that are called the Enlightenment. ... The essence of Venice is oligarchism, usury, slavery, and the cult of Aristotle." "Yet, once again, the evil of Babylon and Canaanite Tyre outlived its former host. The Venice which Byzantium had spawned, as its finance-oligarchical marcher-lord to the West, fed upon the corpse of its mother, in the Fourth Crusade, and became the new Babylon. Then, once again, the Whore of Babylon found a new incarnation. As the A.D. 1510 near-victory of the League of Cambrai demonstrated, the change in European institutions set into motion by the A.D. 1461-1483 establishment of the first modern sovereign nation-state, the France of Louis XI, showed that Venice's ability to exert imperial power from the head of the Adriatic was ultimately, fatally imperilled by the emergence of this new, anti-imperialist institution. Under the leadership of Venice's Paolo Sarpi, the Netherlands and England were assimilated, step-by-step, as a new base of operations for imperial Venetian, financier-oligarchical maritime power." -- Lyndon LaRouche, "Echoes of Civil Wars in Ancient Rome", The American Almanac, August, 1996. "The oligarchical system of Great Britain is not an autocthonous product of English or British history. It represents rather the tradition ...which has been transplanted into the British isles through a series of upheavals. ... into England and Scotland of the Venetian oligarchy, along with its philosophy, political forms, family fortunes, and imperial geopolitics." -- Webster Tarpley, "The Venetian Takeover of England", Conference Speech, 1994. "The Venetian method is the method of not taking sides, but playing sides against one another, to one's advantage. You go into a country, you go among a people, you go to an individual person, and you corrupt them by knowing the principle of corruption which is imbedded in every person. That principle of corruption is the person's self-ego as an autonomous ego, as a microcosm, in counterposition, in struggle, against the macrocosm. Not the individual as a part of the macrocosm, as a reflection of the macrocosm; not the individual as imago Dei -- in the image of God the Creator -- but the individual as a sensual creature in war against not all but the all, to correct the ordinary reading of Hobbes. "Once you understand that method, you can see the examples of how that method is consciously applied by the Venetians, in philosophy and elsewhere. That is what empiricism is, what materialism is, in the form in which people like Pompanazzi,Gasparo Contarini, and so forth, introduced it [into western philosophical thinking]. "To cultivate this sensuality, through sense-certainty, by making sense-certainty primary and convincing people that sense-certainty is primary, is the principle of evil. To convince people that that which affects their senses and their appetites and their impulses, as Adam Smith echoes this outlook in his Theory of the Moral Sentiments and again in his treatise on free trade, The Wealth of Nations, is the principle of evil." -- Lyndon LaRouche, "Venice Represents a Principle of Evil," The American Almanac, May 16, 1994. "That abundance of bodies are hard we learn by experience; and because the hardness of the whole arises from the hardness of the parts, we therefore justly infer the hardness of the undivided particles, not only of the bodies we feel, but of all others. ...That all bodies are impenetrable, we gather not from reason, but from sensation. ... The extension, hardness, impenetrability, mobility and inertia of the whole result from the extension, hardness, impenetrability, mobility and inertia of the parts; and hence we conclude the least particles of all bodies to be also all extended, and hard and impenetrable, and moveable, and endowed with their proper inertia. And this is the foundation of all philosophy." -- Isaac Newton, Rule 3 of "Rules of Reasoning in Philosophy", Book Three, "System of the World in Mathematical Treatment", Mathematical Principles of Natural Philosophy , Third Edition, 1726. "Natural religion itself, seems to decay (in England) very much. Many will have human souls to be material: others make God himself a corporeal being. "Mr. Locke, and his followers, are uncertain at least, whether the soul be not material, and naturally perishable. "Sir Isaac Newton, and his followers, have also a very odd opinion concerning the work of God. According to their doctrine, God Almighty wants to wind up his watch from time to time: otherwise it would cease to move. He had not, it seems, sufficient foresight to make it a perpetual motion. Nay, the machine of God's making, is so imperfect, according to these gentlemen; that he is obliged to clean it now and then by an extraordinary concourse, and even to mend it, as a clockmaker mends his work; who must consequently be so much the more unskilful a workman, as he is oftener obliged to mend his work and to set it right. According to my opinion, the same force and vigour remains always in the world, and only passes from one part of matter to another, agreeably to the laws of nature, and the beautiful pre-established order. And I hold, that when God works miracles, he does not do it in order to supply the wants of nature, but those of grace. Whoever thinks otherwise, must needs have a very mean notion of the wisdom and power of God." -- Gottfried Leibniz, from "Letter Written to Caroline, Princess of Wales", November, 1715, and later included as the first letter in the Leibniz-Clarke Correspondence, Manchester University Press, 1956. "... For the thinker who grasps the causes of things in his mind before they appear to the senses, stands nearer [to the creative truth] than those who only begin to consider things after they have seen them with their eyes." -- Johannes Kepler, Debate with the Messenger of the Stars, 1610 -- written in response to Galileo's Sidereal Messenger. "An Instrument Maker, knighted for making Sun Dyals better than others of his trade and thought to be a Conjuror, because he knew how to draw Lines and Circles upon a Slate, which nobody could understand. " -- Jonathan Swift, an epitaph for Isaac Newton. "1849 was to be the most terrible year of all. ... 'Every village has dead bodies unburied for many days,' wrote an eye-witness. 'Almost every hovel in the suburb of this town has its corpse. ... May God forgive our rulers for this cruel conduct towards God's creatures here . ... The poor are dropping into their graves in multitudes.' ... And yet it was that very autumn that a list of exports of food from Cork on a single day, 14 November 1948 ran as follows ... 'We do not propose' said the Prime Minister [Lord John Russell], 'to interfere with the regular mode by which Indian corn and other kinds of grain may be brought into Ireland.' The process would be left to market forces. ... "-- Robert Kee, Ireland, A History, Little Brown and Company, 1980, p 87, p100. "As Treasurer Trevelyan [British Treasury Head Sir Charles Treveleyan] wrote in 1847: 'The problem of Irish overpopulation being altogether beyond the power of man, the cure had been supplied by the direct stroke of an all-wise Providence.'" -- Paul Gallagher and Linda de Hoyos, "Rwanda and the Irish Great Potato Famine: British Experiments in Human Extermination" The American Almanac, November 18, 1996. "The administration of the great system of the universe ... the care of universal happiness of all rational and sensible beings, is the business of God and not of man. To man is allotted a much humbler department, but one much more suitable to the weakness of his powers, and the narrowness of his comprehension; the care of his own happiness, of that of his family, his friends, his country.... But though we are endowed with a very strong desire of these ends, it has been intrusted to the slow and uncertain determinations of our reason to find the proper means of bringing them about. Nature has directed us to the greater part of these by original and immediate instincts: Hunger, thirst, the passion which unites the two sexes, the love of pleasure, and the dread of pain, prompt us to apply those means for their own sake, and without any consideration of their tendency to those beneficent ends which the great Director of Nature intended to produce by them.'' -- Adam Smith, The Theory of Moral Sentiments, 1759. "... every individual necessarily labours to render the annual revenue of the society as great as he can. He generally, indeed, neither intends to promote the public interest, nor knows how much he is promoting it. ... he intends only his own gain, and he is in this, as in many other cases, led by an invisible hand to promote an end which was no part of his intention. Nor is it always the worse for the society that it was no part of it. By pursuing his own interest he frequently promotes that of the society more effectually than when he really intends to promote it. ..." -- Adam Smith, Wealth of Nations , 1776, Vol I, Book IV, Ch. II, 421. "... Much as history has been written otherwise, slavery, secession and the great war fought to insure the survival of this nation between 1861-65, was a battle against the destructive policies of what was then known as "British" free trade. The southern Confederacy, along with its doctrines of human slavery, states rights and secession, was the institutionalized manifestation of British free trade policies in America. It was free trade that created slavery, as part of a system that oppressed the majority of the southern population, and turned that section into a despotic, oligarchical nightmare in total opposition to the principles of republicanism upon which this nation was founded." -- Frederic Henderson, "The Doctrine of Free Trade and the Confederate States of America", American Almanac , 1991. National Economy -- The American System -- Hamilton, Lincoln, the Careys, et al. "The Wealth of Nations was not published in the United States until 1789. Though read and admired, it did not at once persuade. 'In the US,' E. A. Johnson has written, '... it is difficult to find any thoroughgoing 18th century proponents of laissez faire, and even harder to find such explicit evidence of legislative acceptance of a theory of economic freedom.' In his first annual message, Washington recommended a national policy of advancing 'agriculture, commerce, and manufactures by all proper means.' The early Congresses assumed that the national authority ought to help any interest significant enough to deserve national attention. All sides invoked the 'fostering hand of government.' Disagreement arose over priorities not over principles. For the Hamiltonians, the national government was the grand instrument by which to transform a pastoral economy into a booming industrial nation. Dismissing the 'reveries' of Adam Smith, Hamilton invoked the example of 'the great Colbert' as showing the way to national power. He believed more than Colbert in individual acquisition as a motive, but had little confidence in self-interest as the organizing principle of society. The notion that the economy could regulate itself Hamilton called a 'wild speculative paradox.' The 'Spirit of enterprise,' he wrote in the 7th Federalist, when 'unbridled,' leads to 'outrages, and these to reprisals and wars'. Americans, as his Report on Manufactures summed up his view, had 'a certain fermentation of mind, and certain activity of speculation and enterprise which if properly directed may be made subservient to useful purposes; but which if left entirely to itself, may be attended with pernicious effects.' His great program of the 1790s called on the state to steer wealth to those who would employ it under public guidance to stimulate national productive energy." -- The Cycles of American History, Arthur M. Schlesinger, Jr., Houghton Mifflin Company, 1986, p. 220-221. "To cherish and stimulate the activity of the human mind, by multiplying the objects of enterprise, is not among the least considerable of the expedients by which the wealth of a nation may be promoted." -- Alexander Hamilton, Report on the Subject of Manufactures , 1791.
" I confine my exertions solely to the refutation of the theory of Adam Smith and Co., the fundamental errors of which have not been understood so clearly as they ought to be. It is this theory, sir, which furnishes the opponents of the American System the intellectual means of their opposition." -- "Letter from Friedrich List to Charles Ingersoll", July 1, 1827, published as Outlines of American Political Economy . "... they entirely misapprehend the object of political economy. This object is not to gain matter in exchanging matter for matter as it is in individual and cosmopolitan economy, and particularly in the trade of a merchant. But it is to gain productive and political power by means of exchange with other nations ... in other words, there is a capital of nature, a capital of mind, and a capital of productive matter, and the productive powers of a nation depend not only upon the latter, but also and principally upon the former." -- "Letter IV from Friedrich List to Charles Ingersoll", July 18, 1827, published as Outlines of American Political Economy .
" The present condition of nations is a result of the accumulation of all the discoveries, inventions, improvements and efforts of all the generations that lived before us; they form the intellectual capital of living mankind, and every nation is only productive to the extent that they have known how to take up into themselves the achievements of earlier generations and to increase those through their own acquisition. ... Let us recall here the productions of the few whose work is responsible for the invention and improvement of the steam engine. ... They have given to a small number of men the power to perform work for whose accomplishment previously millions of men would have been necessary. ... What is important is not wealth, but the capacity to produce wealth." -- "Letter from Friedrich List to Charles Ingersoll", 1827, published as Outlines of American Political Economy . "The abolition of serfdom had occurred in the spring of 1861, and a vast program of railroad building was under way. 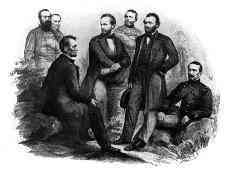 Lincoln was also aware that both Gorchakov and the czar were pro-American and anti-British. In May 1861, in choosing his personal envoy to St. Petersburg, Lincoln went outside of normal channels, and selected the nephew of American Whig statesman Henry Clay, Cassius Marcellus Clay, as his ambassador to Russia. "Clay brought with him many copies of one of the primary treatises of the "American System" of political economy, Henry Carey's book The Harmony of Interests: Agricultural, Manufacturing, and Commercial, hand delivering them to Alexander II, Gorchakov, Navy Minister Prince Dolgoruky, Grand Duke Constantine, and a host of other high officials and industrialists. ... Clay toured the major cities, delivering speeches to thunderous applause from captains of industry, regional and national government officials, and merchants, expounding on the need for Russia to industrialize. His speeches were reprinted throughout the Russian press, and the name Henry Carey became a household word in Russia." -- Konstantine George, "The U.S.-Russian Entente That Saved the Union", The American Almanac , August 3, 1992. "... The United States is a Leibnizian Platonic republic, in opposition to the British Empire and the Confederacy. EIR historians .. have unearthed the real story of how the Founding Fathers repudiated [John] Locke and [Isaac] Newton...." -- Susan Welsh, "From the Associate Editor", The Executive Intelligence Review, December 1, 1995. "That the Government of England is as great a, if not the greatest, perfection of fraud and corruption that ever took place since governments began, is what you cannot be a stranger to, unless the constant habit of seeing it has blinded your sense." -- Tom Paine, 1792; quoted as a chapter heading by Cheddi Jagan, in his book The West on Trial: My Fight for Guyana's Freedom , 1966. 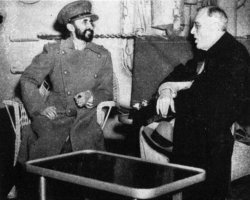 "We Americans may have some disagreement among ourselves as to what we are fighting for, but one thing we are sure we are not fighting for is to hold the British Empire together. You can't understand us at all unless you realize how much principles mean to us. We fought you on principle in the first place." -- Franklin D. Roosevelt, "Open Letter To The People of England", published in Life magazine, October 12, 1942. Africa -- Colonialism and Depopulation Then; Raw Material Cartels, IMF Controls, Game Park Preserves, and Depopulation Now -- The Fight for National Sovereignty in Africa. "Instead of recommending cleanliness to the poor, we should encourage contrary habits ... we should ...crowd more people into the houses, and court the return of the plague. ... But above all, we should reprobate specific remedies for ravaging diseases; and those benevolent, but mistaken men, who have thought they were doing a service to mankind by projecting schemes for the total extirpation of particular disorders. If by these and similar means the annual mortality were increased from 1 in 36 or 40, to 1 in 18 or 20, we might possibly every one of us marry at the age of puberty, and yet few be absolutely starved." -- Thomas Malthus, The Essay on Population , 5th edition, 1817. "At present, the population of the world is increasing at about 58,000 per diem. War, so far, has had no very great effect on this increase, which continued throughout each of the world wars. ... War has hitherto been disappointing in this respect. ... but perhaps bacteriological war may prove effective. If a Black Death could spread throughout the world in every generation, survivors could procreate freely without making the world too full. The state of affairs might be unpleasant, but what of it?" -- Bertrand Russell, in Impact of Science on Society, 1951. "In the event I am reborn, I would like to return as a deadly virus, in order to contribute something to solve overpopulation." -- Prince Philip, founder of the World Wildlife Fund, quoted in Deutsche Presse Agentur , August 1988. "Political Economy is not Cosmopolitical Economy. ... 3. How another old commonplace of the cosmopolitan theory, 'to buy from abroad if we can buy cheaper than manufacture,' may stand against such an exposition I cannot conceive. We buy cheaper from foreign countries only for a few years, but for ages we buy dearer; we buy cheap for the time of peace, but we buy dear for the time of war; we buy cheaper apparently if we estimate the prices in their present amount of money, but we buy incomparably dearer if we estimate the means wherewith we can buy in future. ... Into such gross errors fall wise and learned men, if their theory has a wrong basis, if they take cosmopolitan for political principles, if they treat the effects of exchange of matter instead of treating the cause of the rise and fall of productive powers. Smith and Say advise us to buy cheaper than we can manufacture ourselves, in contemplating only the gain of matter in exchanging matter for matter. But weigh the gain of matter with the loss of power, and how stands the balance?" -- Friedrich List, "Letter VIII to James Ingersoll", Principles of American Political Economy , July 27, 1827. "History will censure them for having separated national economical views from national political views, as it censures Poland for having sold her independence and power for the benefit of selling wine, as it laughs at Esau for having sold his primogenitive birthright for a mess of pottage, rather than to rely on his own power for procuring the means of existence. " -- Friedrich List, Outlines of American Political Economy , Letter III, July 15, 1827. "... there are those who smuggle opium to seduce the Chinese people and so cause the spread of the poison to all provinces. Such persons who only care to profit themselves, and disregard their harm to others, are not tolerated by the laws of heaven and are unanimously hated by human beings. His Majesty the Emperor, upon hearing of this, is in a towering rage. ... We find your country is sixty or seventy thousand li [three li make one mile, ordinarily] from China. Yet there are barbarian ships that strive to come here for trade for the purpose of making a great profit. ... By what right do they then in return use the poisonous drug to injure the Chinese people? ... in coveting profit to an extreme, they have no regard for injuring others. Let us ask, where is your conscience? ..." Commissioner Lin Zixu [Lin Tse-Hsü 1785-1850 -- Chinese Commissioner in Canton] -- "Letter of Advice to Queen Victoria," 1839. (Opium Wars follow: 1839- 1842). "It seems to me perfectly in the cards that a euphoric drug far more efficient and less harmful than alcohol may be produced, and if this should be introduced into every bottle of Coca Cola, then clearly, as I ventured to point out more than twenty-five years ago in Brave New World, this would become an incredibly powerful instrument in the hands of a dictator. ... What is becoming, I think, quite clear now is that dictatorships of the future probably will not be based on terror, as the dictatorships of Hitler and Stalin. Terror is an extremely wasteful, stupid and inefficient method of controlling people. In Brave New World the distribution of this mysterious drug, which I called soma... was a plank in the political platform. "There will be in the next generation or so a pharmacological method of making people love their servitude and producing dictatorships without tears, so to speak. Producing a kind of painless concentration camp for entire societies so that people will in fact have their liberties taken away from them but will rather enjoy it, because they will be distracted from any desire to rebel -- by propaganda, brainwashing, or brainwashing enhanced by pharmacological methods; and this seems to be the final revolution." (emphasis added) -- Aldous Huxley, "The Final Revolution", 1959, speech at a symposium at a University of California medical school. "The question is a philosophical, anthropological and psychological one, and perhaps also a religious one. It is: can human nature be changed in such a way that man will forget his longing for freedom, for dignity, for integrity, for love -- that is to say, can man forget that he is human? ... None of the three authors can be accused of the thought that the destruction of the humanity within man is easy. Yet all three arrive at the same conclusion: That it is possible, with means and techniques which are common knowledge today." -- Erich Fromm, written as the "Afterword" of George Orwell's 1984 , New American Library, 1961. "Knowledge is not a matter of deductive consistency among mere words ... In all of modern civilization, the discovery of a new principle arises as the resolution of a devastating paradox of the ontological form typified by that of Plato's Parmenides. ... All true human knowledge is, in fact, a miracle, and that in the strictest usage of the term. ... Such ideas are generated through resolution of those kinds of paradoxes which shatter faith in the monkey-gods of simple sense-certainty." -- Lyndon LaRouche, Michael Novak, Calvinist? -- "Not By Marketplace Alone!" , 1997. "But, what happens, is, in the process of education, if it's a Classical humanist form of education, then you are not taught what to believe, but you are walked through the experience of facing a paradox, and working through the paradox to a solution. Or, in art, a metaphor, the same thing. So, metaphor and paradox, as part of education, are the key, which is why I have been pushing these pedagogical exercises. Not necessarily because any one of these principles is vital to us, as such; but, what is vital to us, is -- how do we make sensuously actual, a cognizable perception, or apperception, of this process? " -- Lyndon LaRouche, Discussion, 1996. "New discoveries in the sphere of his activities, which cast the bread-fed scholar down, delight the philosophical mind. Perhaps they fill a gap which had still disfigured the growing whole of his conceptions, or they set the stone still missing in the edifice of his ideas, which then completes it. Even should these new discoveries leave it in ruins, a new chain of thoughts, a new natural phenomenon, a newly discovered law in the material world overthrow the entire edifice of his science -- no matter! He has always loved truth more than his system, and he will gladly exchange the old, insufficient form for a new one, more beautiful. Indeed if no blow from the outside shatters his edifice of ideas, he himself will be the first to tear it apart, discontented, to reestablish it more perfected. Through always new and more beautiful forms of thought, the philosophical mind strides forth to higher excellence, while the bread-fed scholar, in eternal stagnation of mind, guards over the barren monotony of his school-conceptions." -- Friedrich Schiller, Universal History , published in Friedrich Schiller, Poet of Freedom, Volume II, Schiller Institute, 1988, p. 57. "... This comes into economics in a very simple way: That the increase in the productive powers of labor arise from discoveries of principle, which can not be derived by accepted classroom mathematics. There is no possible way you can make a discovery of principle with mathematics, or derive it from mathematics. It cannot be done. As Riemann says, you have to leave the department of mathematics, to go into the department of physics, that is, into the area of paradox, of mathematical discontinuities and singularities, and prove a concept, and then bring that proven concept back to the classroom, and revolutionize, that is, the existing mathematics, to overhaul it, to change it fundamentally, by changing the underlying set of axioms and postulates so you're creating a new kind of mathematical physics--not a mathematics, but a mathematical physics--which corresponds to the discovery you made, not by way of deriving it mathematically, but by stepping outside the bounds of insanity ..., into the real world.
" In physics, we discovered that this is not true; that all physical processes have a physical curvature, as we later came to call it, which is absolutely different from that of a Newtonian, Cartesian, or Euclidean space-time, as generally taught. Then we find that the events, the significance of action in each physical space-time is different than in any other physical space-time.
" The same thing applies to political processes.... The same thing in society. Take the assumptions of God, man, and nature and their relationship. "What are the assumptions of the imperial model? That man is a beast, with certain instincts and related impulses--very much as Hobbes argues the case. And that from the interaction among these beasts, in a sort of gas theory model type, you get a result, which is called the end-result of society. That's the basis for Locke's conception, Hobbes' conception, for de Mandeville's conception, the theory of the "invisible hand" or of immorality, in the case of Adam Smith, and so forth. And of all these modern empiricists.
" Now, in such a society, the physical-economic result is that since the expansion of production, and the continuation of production of the material requirements of society, demands a depletion of what any existing technology defines as necessary resources, that the society, merely by continuing to exist, is entropic. And the more it progresses, the faster it grows, both technologically and in terms of population, the faster it's going to decline, entropically.
" Therefore, in such a society, there can be no profit for the society as a whole. Because the profitability of some part of the society depends upon increasing the entropy of the other part of society. ... Therefore, the minds of persons in that society will respond to events on the basis of that presumption, just as these primitive apes who are called environmentalists or ecologists, react to these questions today.
" Whereas if we take the other image, the image that man is in the image of God and has his creative power to increase the productive powers of labor through the cognitive process, which is not-entropic, then profit comes to society--from what? It comes from improving universal education in a Classical humanist form. It comes from emphasizing, at all costs, technological and cultural progress, especially in the mode of production -- for the society as a whole. ..." -- Lyndon LaRouche, April, 1996. "The military commander of the type that does the great flanking operation, such as Alexander the Great, or Hannibal, or Sherman, or designed by von Schlieffen, or MacArthur in World War II, actually has a superior mind to his opponent. And that's the secret of the great commander, all other things being equal." -- Lyndon LaRouche, "The Principles of Cannae", 1996. "The judicial 'railroad' of LaRouche "represent(s) a broader range of deliberate cunning and systematic misconduct, over a longer period of time, utilizing the power of the federal government, than any other prosecution by the U.S. government, in my time or to my knowledge." -- Former U.S. Attorney General Ramsey Clark, 1993.